Within the Colombia Origin Select program, the coffees are pre- selected, before processing, from various smallholders and coops. 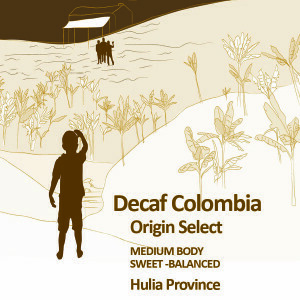 They are then processed in the Huila region of Colombia using a natural occurring composition extracted from sugar cane. There is a noticeable difference in cup quality as a result of this method of bean selection and processing. We have always favored this method of processing as we believe the result is a sweeter cup with more complex character than water processed decafs.